Return to Esedeth! 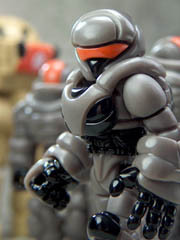 New Glyarmor/Vartyrex figures, a few Crayboth, and a lone new Armorvor sold out quickly. Click here to see the April 29 2016 Onell Design drop menu. Click here to order what's still available - a lot has sold out, and the store had some snags. See what you can get! As I write this, 8 out of 18 items remain in the store. It's new! Coming Thursday Friday at 9:30 PM Eastern - Return to Esedeth! Onell Design has a drop with... something. You can see Robo Force and others in the picture, with more new things coming. Probably. We don't know. Click here for the announcement. The line is expected to launch at noon Pacific on Friday, April 8. Painted figures are $15, unpainted figures are $10. Each figure includes one of each head, all of the armor and weapon bits, and that's not bad. They appear to be similar in size to the great Rise of the Beasts line. Click here for Spy Monkey Creations, which at press time does not have any information on this line. Battle Tribes does not appear to have an active site on any of the domains I tested.